These documents relate to a period of mounting tension during the winter of 1937-1938. They show how different politicians in the Conservative government at the time viewed the international situation. These men included Prime Minister Neville Chamberlain, Foreign Secretary Anthony Eden and the MP Winston Churchill. By this time Germany had already re-occupied the Rhineland in March 1936 against the terms of the Treaty of Versailles and Locarno Pacts. Italy and Germany had formed the Rome-Berlin Axis in October 1936 which meant that Mussolini and Hitler promised to support each other in event of war. A month later Germany and Japan had signed the Anti-Comintern Pact directed at the Soviet Union. Italy left the League of Nations in 1937 and joined the Anti-Comintern Pact in the same year. Look at the documents in this lesson and find out about some of the differences between British politicians which existed over foreign policy before the outbreak of the Second World War. 1. Look at Source 1a, b and c. This is a letter from Anthony Eden to Neville Chamberlain. Can you describe the tone of the letter in the first paragraph? Is it formal or informal? Was it intended to be read by Chamberlain alone do you think? What evidence is there from the letter that Eden thought it important to build US support? Which aspects of Britain’s defences did Eden think needed improving? What phrases can you find in the letter that show that Eden seemed to be underplaying his concerns? Clue: think about use of language and tone. What do you think the hand written comment made by Chamberlain at the top of the letter suggests? Clue: ‘No. 11’ refers to Downing Street the offices of the Chancellor of the Exchequer. Why did Eden write this letter to Chamberlain? Can you find evidence in the letter for any of the following reasons? 2. Look at Source 2. This is another letter from Eden to Chamberlain. 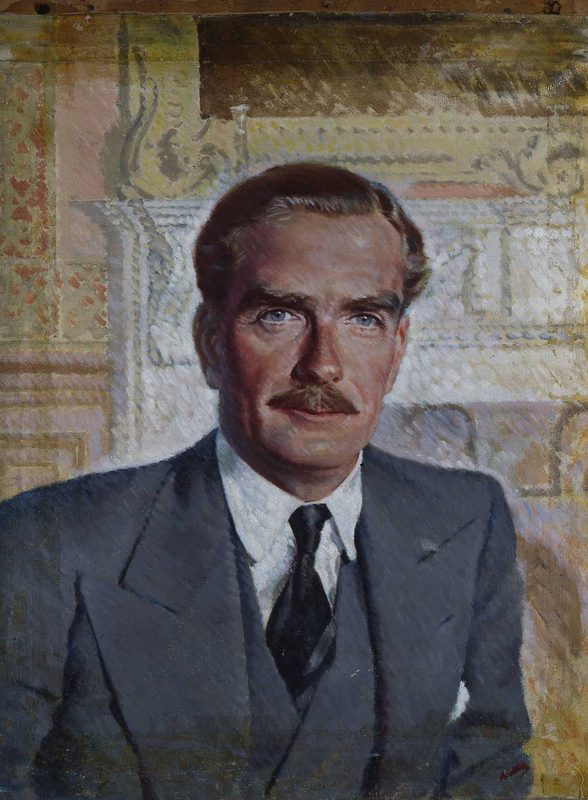 Why has Anthony Eden written this letter? What is the tone of the letter? Look at Source 3. This is an extract from Churchill’s speech to the House of Commons on 22 February 1938. Why is it helpful to think about how and where this speech was delivered? What examples can you find in Churchill’s speech of exaggerated or emotive language? What is the immediate cause for Eden’s resignation according to Churchill? Can we trust Churchill’s wider explanation for Eden’s resignation? What are Churchill’s views on how foreign policy should be handled at this time? When Eden writes that 1938 will be difficult year, he might be referring to Italy’s resignation from the League of Nations just three weeks previously. Eden mistrusted Italy almost more than Germany though he was certainly aware of the growing German threat. Britain was also concerned about her possessions in the Far East: Hong Kong, Malaya and Singapore. The threat of Japanese aggression was a constant source of worry to British defence planners as Britain needed to maintain strong naval links with the Empire and if necessary defend its outposts. The role of the United States is vital in understanding the whole issue of appeasement. Eden felt it was futile to try to reach agreement with the dictators. The best way to avoid war, in his opinion, was to involve the US alongside Britain in the Far East. If there were a European war, the US would automatically be committed as Britain’s ally. He felt that all should be sacrificed to the objective of Anglo-American co-operation and actively sought Roosevelt’s support. Chamberlain on the other hand wanted to steer British policy more in the direction of appeasement in Europe and expected little from the United States. It was Chamberlain who sent a cold answer to Roosevelt’s suggestion for an international conference. Eden took offence as he had been trying to encourage American involvement. Tensions between the two men mounted. Eden and Chamberlain were both concerned with rearmament but Chamberlain was primarily worried about growing costs. In December 1937 Eden expressed his concern on this matter. At the start of 1938, the international situation was becoming increasingly tense. Hitler was putting pressure on Austria to accept the union, or Anschluss, between Germany and Austria. Chamberlain was prepared to recognise Italy’s conquest of Abyssinia (Ethiopia) to keep Italy as an ally in order to isolate Germany. Chamberlain’s cabinet ‘agreed that every effort must be made to come to an arrangement with Italy’ (catalogue reference: CAB 23/92 f255). Eden found this unacceptable and resigned. Lord Halifax replaced him as Foreign Secretary. This lesson could be used as part of a teaching programme for any of the main GCSE modern world history courses for key stage 4 relating to the study of appeasement. The sources allow students to explore some of the main issues in British foreign policy and the importance of not accepting sources at face value. Some teachers may also wish to use this lesson in conjunction with our two other lessons on Germany’s occupation of the Rhineland and Chamberlain and Hitler. It could also be used by key stage 3 students studying twentieth century history in the same way. Some historians argue that the real explanation for Eden’s resignation in February 1938 lay in Chamberlain’s misplaced conduct of foreign policy and his refusal to consult Eden or the Foreign Office. From the moment he became Prime Minister in 1937 he did not hesitate to act independently. It appears as if there were no meetings of the Foreign Affairs Committee between 1 July 1937 and January 1938. However, Eden’s resignation was not necessarily inevitable or even predictable when he wrote in December 1937. Disagreements and tensions between politicians are not unusual. In the 1930s, few would have guessed that Winston Churchill would become Britain’s war leader. Distrusted by fellow Conservatives, he vigorously opposed the policy of appeasement, fearing that it would only encourage Hitler’s appetite for more ‘living space’. He attacked his party in government for failing to rearm the country.